Anderson Lake Lodge sits high atop the hill across the road from beautiful Anderson Lake. This property is all about fun, recreation and relaxation for large groups of family and friends to enjoy. You'll have plenty of room to roam through our 17 acre wooded back yard with walking trails for you and your guests. With 2,700 sq. ft. this three level spacious lodge sleeps 12 comfortably and has plenty of room for everyone inside and out. We have five bedrooms, ten assorted size beds and two sofas with all the bedding you'll need. You'll also appreciate having a bathroom on each level. In the heart of the north woods by Mountain, Suring, Lakewood and Townsend you will have plenty of activities to choose from and numerous lakes to explore. Take advantage of local activities including, nearby swimming, fishing, ice fishing, golfing, gift shops, horseback riding, hunting, casinos, biking, ATV trails, snowmobile trails, cross country trails and much more. We are located in Oconto County which works in conjunction with local ATV clubs to provide over 450 miles of fully interconnected scenic ATV trails for your enjoyment! You will find trail maps in the Lodge or just ask and I will be happy to send one to you with your registration packet. We are proud to be sponsors of the Wisconsin ATV Association (WATVA) and The Dusty Trails ATV Club. The surrounding area not only boasts endless ATV trails but endless snowmobile trails as well. We support the Association of Wisconsin Snowmobile Clubs (AWSC) through our continued sponsorship as well as the local Chute Pond Snowmobile Club. Anderson Lake provides great fishing, and water sports. We are located across the road from Anderson Lake but there is NO direct access to the lake from the property if that is the focus of your getaway. You can however venture out in either direction to explore one of the many recreational lakes in the area offering fishing, rafting, swimming, tubing and more. For those willing to endure the cold the Ice Fishing is also very popular on both of these lakes. You may want to take part in one of the local ice fishing contests! For cross country ski enthusiasts there are numerous groomed trails nearby. Some local trails would be found in the Chequamegon-Nicolet National Forest. It has two dozen groomed Nordic trails totaling 263 miles. The Lakewood Trail (minutes away) offers scenic beauty, challenging climbs and downhills along its 14 mile route. Also the Nicolet Nordic Ski Trail or Nicolet State Trail. You can find more information on cross country ski trails in our area by going to the Wisconsin Trail Guide website. For hunters, in addition to our 17 acres, there are thousands of acres of State public hunting land nearby. If you prefer some adventure during our spring and summer months, you can take a day trip to enjoy Whitewater Rafting. Just 20 to 30 miles from the Lodge you will find numerous outfitters who offer whitewater rafting tours on the Peshtigo River and the Wolf River. In addition to rafting, one offers rock climbing, paintball, kayak tours and a sixty foot high ropes course and zip line. Information and directions are posted in the Lodge for your convenience. For all the whitewater rafting available in the area check out the Wisconsin Trail Guide website and select Paddle Trails! For a unique experience going back in time you might enjoy taking a ride on the Lumberjack Steam train located just 38 miles from the property. During the summer months (June thru August) they offer train runs from the Depot located in Laona to the Lumberjack Camp Museum. They also have special events that include a Cowboy Reenactment where you will take part in a Wild West train robbery. An event not to miss is the Lumberjack Show in July which has been featured on ABC Wide World of Sports, Discovery Channel and several others. This show has been presented for 25 years drawing over a million visitors. Watch lumberjacks compete in running on logs, axe throwing, pole climbing and other nostalgic competition dating back to the 1900s. During the fall enjoy a ride through the fall colors and take in a Saturday Fall Festival Events. For more information on times of operation and event dates, you can visit the Lumberjack Steam Train website or contact them at 715-674-3414. There are many interesting places to visit and things to do within a short distance from the Lodge. Many of our guests will take a day trip to visit Lambeau Field and the Packer Hall of Fame in Green Bay(45 minutes). Others enjoy a day trip to Door County (1 1/2 hours). The agenda is yours whether you spend time enjoying the amenities of the property or venture out on day trips. If your objective is to just lay low and enjoy the property, the Lodge lower level will keep our guests entertained with games, TV, bar and fireplace. 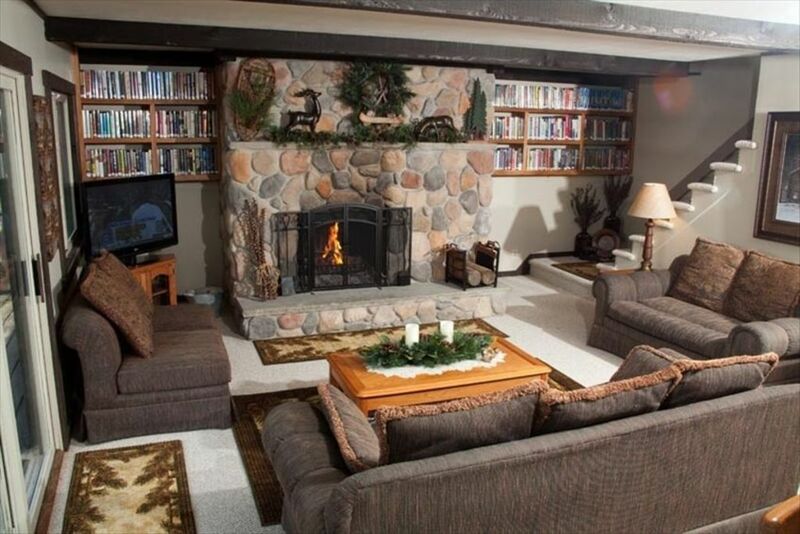 In the living room on the main floor, relax in front of the fireplace with one of our 500 library books. The Lodge property has over one half mile of walking trails throughout the 17 wooded acres. Enjoy hiking, cross country skiing or maybe try snow shoes, but please no ATV or dirt bikes on our walking trails. We also have a regulation size sand pit volleyball court in the back yard and a variety of outdoor games to enjoy. We provide HughesNet Satellite WiFi to our guests as well as Directv with all the available movie and music channels. At the end of the day picture peaceful evenings sitting outdoors around the fire pit reminiscing old memories while making new ones. Anderson Lake Lodge is ideal for families, large and small, or a group of friends who want to enjoy a vacation experience in the north woods. I encourage you to read the reviews from guests just like you who chose Anderson Lake Lodge for their plans with family and friends. Anderson Lake Lodge and the surrounding area has something for everyone, spring, summer, fall and winter. Winter months have become popular for groups of women wanting to craft or just to enjoy a fun girls weekend away from it all. Just pack your PJ's, DVDs and a bottle of wine and you're good to go!! Everyone is welcome to join us during those boring, nothing to do, months of MARCH AND APRIL for a two night getaway with REDUCED RATES. Sit back and relax in front of the fireplace while working on your crafts, reading books, watching movies, playing games or just talking about the long winter while you make plans for what we hope will be an early spring! For your peace of mind, Anderson Lake Lodge is licensed and inspected by the State of Wisconsin, Division of Public Health to assure our guests that everything is up to code for your safety and comfort. We have been welcoming guests for over eight years and our level of commitment and hospitality to our guests has remained our number one priority. We continue to strive to make your stay both comfortable and memorable so gather up your family or friends and we look forward to welcoming you and your guests soon! PLEASE NOTE: YOU MUST BE AT LEAST 30 YEARS OLD AND PRESENT DURING THE STAY TO RENT THIS PROPERTY AND ALL GUESTS MUST BE AT LEAST 21 UNLESS TRAVELING WITH PARENTS OR GUARDIANS. Liquid hand soap, shampoo, conditioner, body wash and toilet paper provided. During the summer months the lake will be less visable due to all the foliage. Central Air with an additional air conditioning unit in the upper loft. Floor fans available also. More than you will need even if you are a large group. 8 chairs at the dining table but you could fit more if necessary. Extra stacking chairs in the basement area. Also two additional bar stools at the counter dividing the kitchen and dining area. One in Living Room and one in the upper loft. Lower level bar area has fireplace (electric), table & chairs for game playing and tv with directv. Variety of board games and kids games available. Balcony off main floor level and another off upper loft area. Members of the Wisconsin ATV Association and the Association of Wisconsin Snowmobile Clubs. Pontoon rentals available at ..........YANCY POWERSPORTS 920-842-2510 Pontoon rentals including delivery................Jet Ski, Boat & Snowmobile rentals & delivery available from POWER SPORTS RENTAL NETWORK 920-428-411l or email him at....eric@rentals-wisconsin.com................MOUNTAIN SPORT & REPAIR 920-373-7258 Local ATV & Snowmobile Rentals and Repair.........LAKEWOOD SKI & SPORT 715-276-3071 Cross county ski rentals & snow shoes and Snowboards Bikes, Kayaks, skis, wakeboards and tubes.................POWERS SERVICE CENTER 715-276-7170 Pontoon and Fishing Boat Rentals PLEASE.....NO FIREWORKS on the property. Fire hazard is just too great with 17 acres of woods and too much garbage left behind. NO FIREARM usage on the property. We do not allow firearm shooting or target practice on the property unless you are booking a hunting stay during hunting season. Disappointed. Thanks for opening your sweet piece of heaven to us girls! Your review makes me wish I was one of the girls with you!! Thank You so much. I truly enjoy hearing stories like this......this is what this property was intended for, a place to just get away and enjoy each other's company. I'm so happy you all enjoyed your stay and I look forward to your return next year!!! The home is perfect for us. Thanks Jim...I'm guessing it must really be "perfect" for you since your were with us last year, this year and I already have your reservations for 2019 and 2020! I'm so glad it works out so well for you guys and that it's so convenient to your hunting land. Happy to have you all and see you next year guys!! Awesome vacation, even better owners! This vacation was so amazing! We had a pretty high bar to reach and nobody thought this was going to do it. WELL, we were wrong! amazing vacation home, amazing owners, and we had an amazing time!! This place was the amazing and absolutely will fit any occasion. Well advertised, even better in person. Thank you for an outstanding "five star" review! Nothing pleases me more than to exceed expectations except maybe knowing I've added some great guests to the annual registration list!! It's always fun to work with guests but every now and then you connect on a little more comfortable level and that makes my day. Thanks John for making my job so easy and enjoyable.....it was a pleasure working with you and I look forward to hearing from you anytime you and your guests are heading in our direction!! Fabulous place to stay. Highly recommend. We had 3 couples in our party and came up to do some ATVing. Fantastic accomodations! They thought of everything right down to the toiletries and bug spray. LOVED it. Trail started at end of driveway so no need to trailer them elsewhere. Wish we could have stayed longer to enjoy every aspect of the property. The only disappointment was that there was 1 full size bed upstairs and the mattress was extremely uncomfortable to sleep on so my husband and I ended up having to sleep seperatly on 2 of the 7 twin beds. I always feel bad when I haven't been able to achieve "five stars" for my guests. The room upstairs will only accommodate a full size bed and even that is a tight fit. This is the first time anyone has mentioned that it's an uncomfortable bed. When we have multiple couples staying they often take the twin beds in the loft area or the two located in the other upper bedroom and put them together to create more space for a couple. The bed selection is based on both size of room and to achieve maximum sleeping for families with children. Sorry you were disappointed with the sleeping accommodations. Couldn’t have asked for anything more in a property. The fire pit is awesome a great place to sit and unwind after a fun day of utving. We will definitely be back next year. Thanks Patti for having such a great property. I love to see "five star" reviews but more importantly I love to hear we'll see you again!! That's our goal.....to provide all the comforts of home so you won't have to look any farther for your UTV getaways. So happy you enjoyed the accommodations, amenities and the fantastic trail system at the front door! Thanks Rob! James B.Where do you live? Our extended family enjoyed our stay at this property. It was convenient to a wedding we all were attending. The property was clean and well kept. It had many amenities. Thank you James for your "five star" review of our property! Being so far from home I'm sure you enjoyed your time with family at the lodge and the local wedding. I'm glad the house worked out for you and that you found everything to your satisfaction. PLEASE NOTE: All rates include four people...any additional guests will be $20.00 per person/per night. All Guests are subject to the minimum stay requirements. Cancellation Policy: Please have your dates firm before making your reservations. Our cancellation policy provides no refund of the $200 deposit made to reserve the dates for you and your guests. 50% refund of the final payment if canceling 14 days prior to your arrival date and No refunds for cancellations less than 14 days prior to check in unless we are able to rent your reserved dates. There are no refunds on Holiday dates being reserved. Any cancellations 13 days or less involving extraordinary circumstances (no snow for snowmobiles is one of those) may apply payments not refunded to another date within the calendar year (excluding Holiday dates being reserved). Our check in time is anytime after 3 pm and check out is by 11 am This property is intended for family gatherings and mature responsible groups of friends. Minimum age to rent is 30 and all guests must be at least 21 years old unless traveling with parents. New Year's Eve stays require the purchase of the damage protection policy. If acquiring a website quote, indicate the number of intended guests staying or the website will default to 2 guests resulting in an incorrect lower quote. We do not allow fireworks on the property...too risky with 17 acres of woods and just leaves too much garbage on the grounds. No firearm shooting unless you have booked a hunting stay.